Dynamic Displays can help you find an affordable solution to replace your Okuma CRT CNC Monitor with a more reliable, energy efficient and modern flat panel LCD. For years, we have specialized in modifying our LCD display monitors to meet our customer’s Legacy Monitor needs. We now provide an affordable drop-in 12” Okuma E0105-800-138 Monitor used on the Okuma OSP Operating Panel 5020 LSY Series and 12″ Okuma E0105-800-020 Monitor used on Okuma OSP Graphic Panel 5000 ASG Series. If we don’t have a standard Okuma CNC Monitor Replacement LCD display already designed for your particular CRT monitor model, we’ll be glad to work with you to arrive at a cost-effective solution. Because many of these systems date to the early 80’s, equipment owners find it very difficult to find replacements for their Okuma CNC Monitors. In some instances, even Okuma no longer supports the particular CNC Machine or system. Our engineering staff will be happy to customize a rugged LCD display to meet the unique Okuma CNC Monitor specifications required and extend the life of your production equipment. For the past several years, Industrial-Panels has concentrated on designing and producing LCD Replacement Monitors for obsolete and hard-to-find Legacy CRT Monitors and Industrial Monitors. Drawing on 25 years experience of manufacturing CRT displays for the OEM market place, we have developed and produces LCD display solutions for a wide range of CNC Machine Tools, Factory Automation, Process Controls and other legacy manufacturing systems. 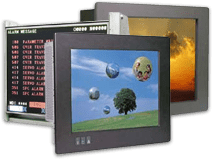 Dynamic Displays industrial LCD replacement monitors are designed specifically for and provide an alternate solution to old worn out CRTs and refurbished CRT replacements with a very short life expectancy. Our replacement solutions are brand new, in stock, and provide a sharp clear image. They are also manufactured in the USA and carry a two year parts and labor warranty and excellent customer support.